A handsome, classic Victorian DETACHED FAMILY RESIDENCE built in the late 19th century offering spacious and well planned family accommodation in one of the most sought after residential areas of Ipswich close to Christchurch Park. 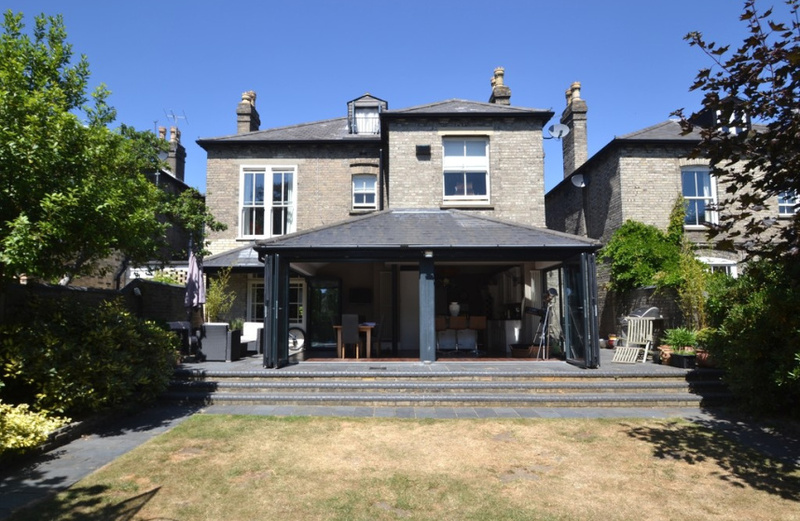 THE PROPERTY A handsome, classic Victorian DETACHED FAMILY RESIDENCE built in the late 19th century of traditional Suffolk white brick construction under a slated roof with double bay front elevation. The property is well recessed from the road by a tarmacadam front garden with ornamental screen walling providing good off road parking facilities. 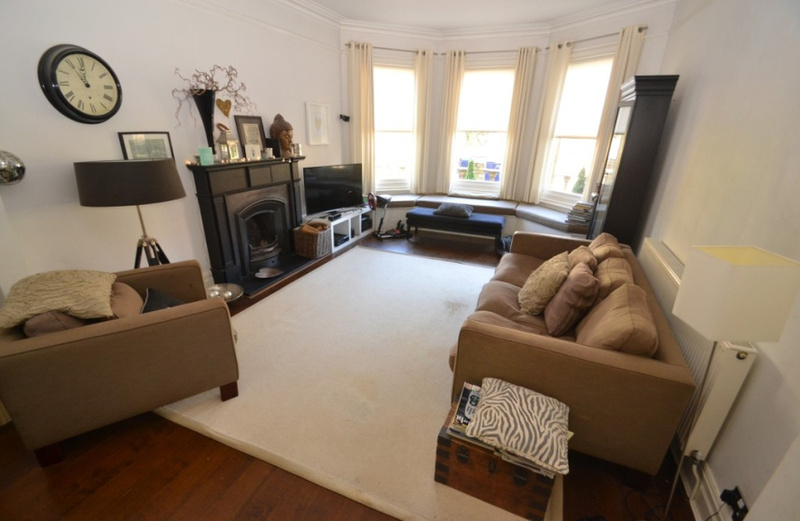 The house offers spacious and well planned family accommodation in one of the most sought after residential areas of Ipswich close to Christchurch Park and within easy walking distance of the town centre and Ipswich School. There is also easy access to St Margarets C of E Primary School, St Helens Primary School and Northgate High School. The house possesses all the charm and character associated with a period house and displays many original finishes including high corniced ceilings, deep moulded skirtings and architraves, sliding sash windows and panelled doors. At the same time it has been very well modernised in recent years and is ideal for the modern family with a feature enlarged open plan kitchen/dining room area with bi-fold double glazed, full length doors opening to the rear garden. 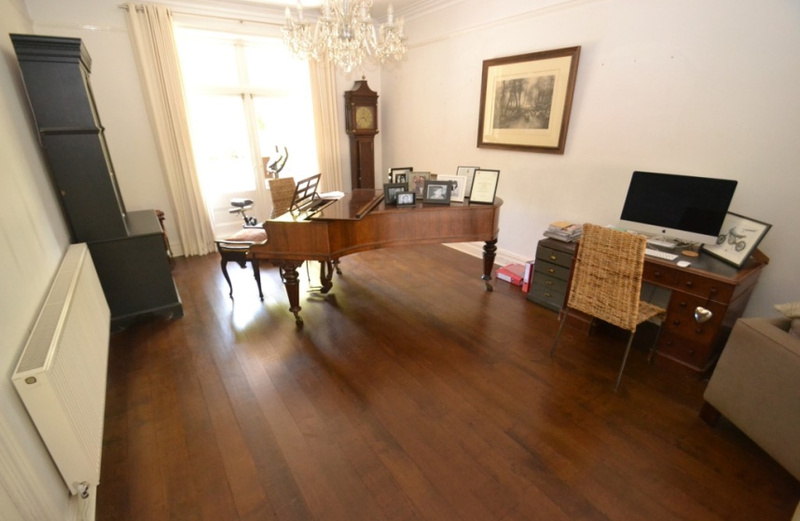 This most appealing property has been very well maintained and decorated throughout and offers accommodation of 3 floors with a large attic room on the second floor and a useful basement area which has been converted to provided storage and an office. 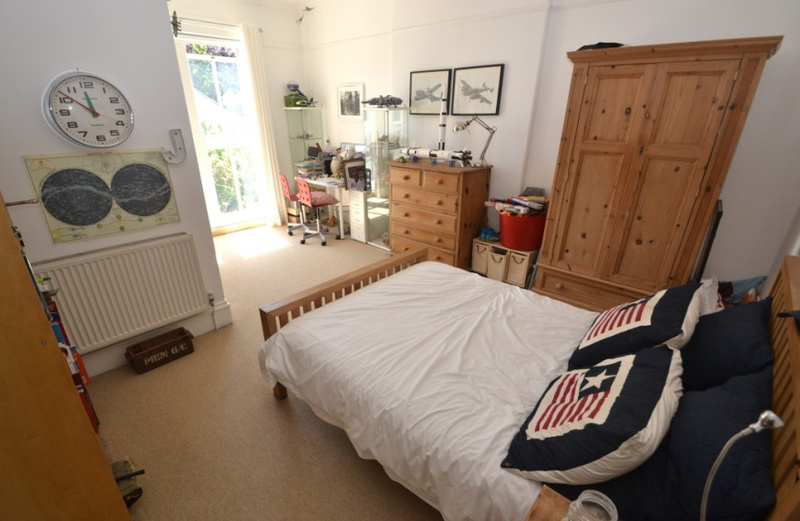 There is also a spacious family bathroom and en-suite shower room to the master bedroom with Victorian style suites. 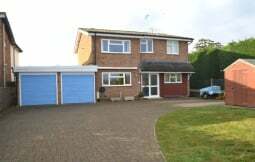 To the rear of the house is an attractive part wall garden with access to a double garage off Vermont Crescent. An internal inspection is strongly recommended to fully appreciated all that is on offer. 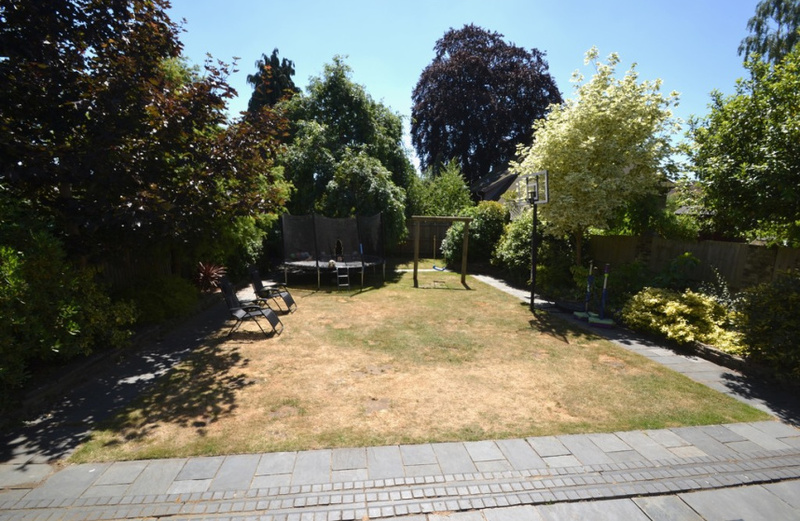 THE SITUATION The house is located in a Conservation Area in what has previously been stated is one of the most sought after residential area of Ipswich and only 10 minutes walk from the town centre and close to the beautiful Christchurch Park. Ipswich is the county town of Suffolk and as such provides all the amenities associated with one of Suffolk's largest conurbations. Culturally there is much to admire - an active theatre, multiplex cinema and there is also a wide range of wine bars and restaurants together with the regeneration of the Waterfront which is an exciting and on-going development for the town. There are also a number of top golf courses in the area including Purdis Heath, Woodbridge, Hintlesham Hall and Felixstowe and a wide choice of schooling in the area. The Suffolk Heritage coastline with its internationally renowned Minsmere Bird Reserve and Snape Maltings is only 40 minutes away, whilst much closer is "Constable Country" with the villages of Flatford and Dedham, made famous by the artist John Constable. For sailing enthusiasts there is a good choice of rivers in the area and Suffolk Yacht Harbour at Levington is only 20 minutes by car. For commuters, Ipswich main line railway station with its regular inter-city service to London's Liverpool Street (approximately 70 minutes) is only 5 minutes by car. In addition, there is easy access to the main A12 and A14 trunk road providing a link to the East Coast Ports, the Midlands and London's M25 motorway. ENTRANCE HALL with exposed floorboards. Picture rail. Telephone point. Inset coconut door mat. Radiator. Corniced ceiling and decorative plastered ceiling rose. Thermostat control. Digital programmer. Stairs to Basement and First Floor. CLOAKROOM Modern white suite of contemporary wash basin (h & c mixer tap) and low level WC with mosaic tiled surround. Radiator. Extractor fan. SITTING ROOM 36' 10" x 13' 3" (11.23m x 4.04m) with central corbelled opening. Feature Victorian cast iron fireplace with decorative surround and mantel and slate hearth. Large bay window to front with 3 sash windows and fitted bench seating. Telephone point. Oak flooring. 2 radiators. Corniced ceiling with decorative ceiling rose. Picture rail. 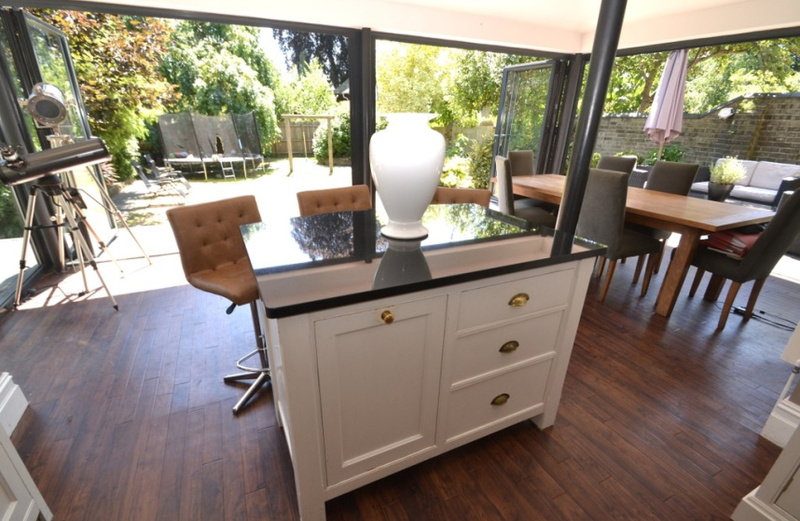 Part glazed double French doors with matching overlights open to terrace and rear garden. FAMILY ROOM 17' 2" x 9' 9" (5.23m x 2.97m) extending to 14'11" Double aspect windows to front and side. Radiator. Picture rail. TV point. Door to PORCH/CYCLE STORE with doors to front and rear. DINING AREA/GARDEN ROOM 24' 2" x 13' 2" (7.37m x 4.01m) A fully glazed room with powder coated aluminium double glazed bi-fold doors on 3 sides opening to rear garden and terrace. 2 modern vertical radiators. "Velux" double glazed skylight. Recessed halogen lighting . UTLITY ROOM 15' 2" x 7' 3" (4.62m x 2.21m) Glazed butler sink (h & c) with brass taps. 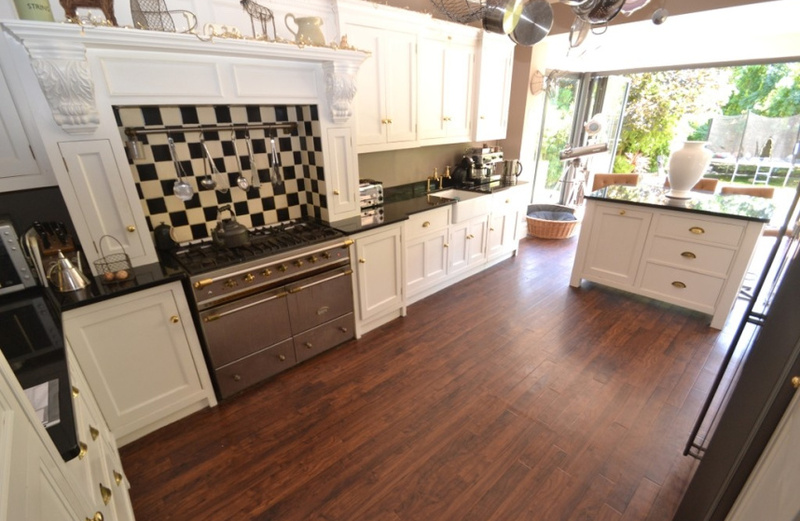 Range of fitted hand painted bespoke fitted base cupboards and drawers with solid wood worktop and draining board with matching eye level wall cupboards and tall broom cupboard. Quarry tiled floor. Plumbing facilities for automatic washing machine. Window to side. Large "Velux" double glazed window. Radiator. Opening to REAR LOBBY with quarry tiled floor and part glazed door to outside. 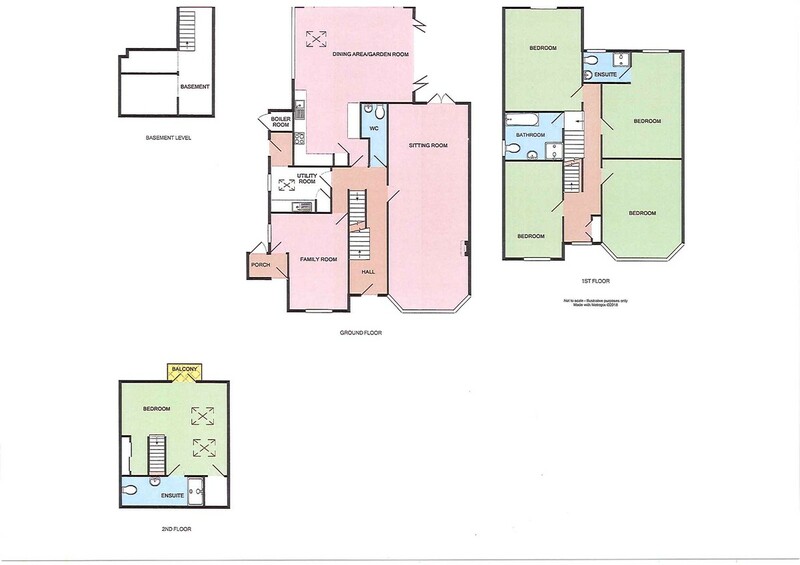 BASEMENT 20' 8" x 16' 4" (6.3m x 4.98m) Approx 6ft ceiling height and incorporating office and storage areas. Recessed halogen lighting. Electric meter cupboard. 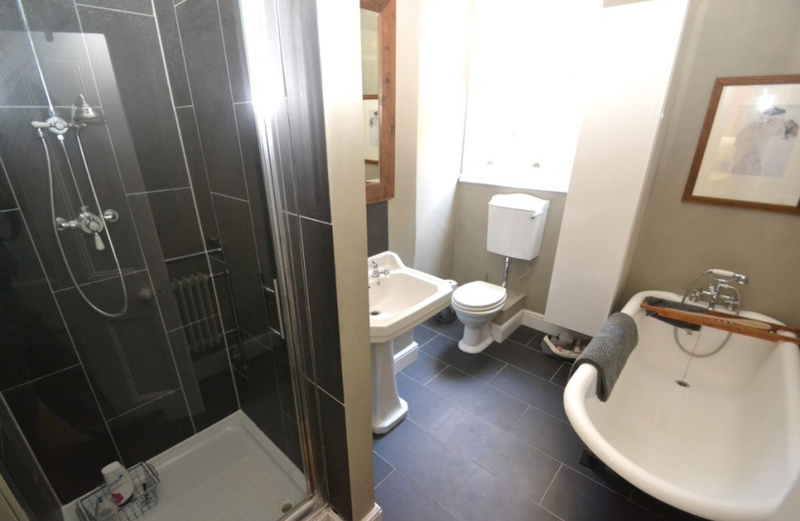 SPACIOUS BATHROOM Victorian style white suite comprising roll top bath on claw feet (h & c mixer tap with shower attachment in chrome) , pedestal wash basin (h & c) with slate splashback and low level WC . Radiator. Sash window to side. Picture rail. Shaver point, fully tiled shower enclosure with "Mira" thermostatic fitted shower. Slate tile floor, Victorian style radiator with chrome heated towel rail. LANDING Radiator. Sash window to front. Fitted double cloaks cupboard. Picture rail. Stairs to Second Floor. BEDROOM 2 18' 4" x 13' 4" (5.59m x 4.06m) (L-shaped) Tall double glazed sash window with views over the rear garden. Radiator. Picture rail. Corniced ceiling. EN-SUITE SHOWER ROOM White contemporary style suite comprising pedestal wash basin (h & c) with slate splashback, low level WC and fully tiled shower enclosure with thermostatic fitted shower with rain forest shower head. Sash window to rear. Radiator. Recessed spotlights, chromium heated towel radiator. Extractor fan and slate tiled floor. BEDROOM 3 17' 11" x 13' 4" (5.46m x 4.06m) Large bay window to front with 3 sash windows. Radiator. Picture rail. Corniced ceiling. BEDROOM 4 16' 11" x 13' 2" (5.16m x 4.01m) Sash window to rear. Radiator. Picture rail. Fitted shelved cupboard with hanging rail. BEDROOM 5 16' 0" x 9' 9" (4.88m x 2.97m) Sash window to front. Radiator. Shelved recess. Built-in wardrobe cupboard with hanging rail and shelf. Picture rail. 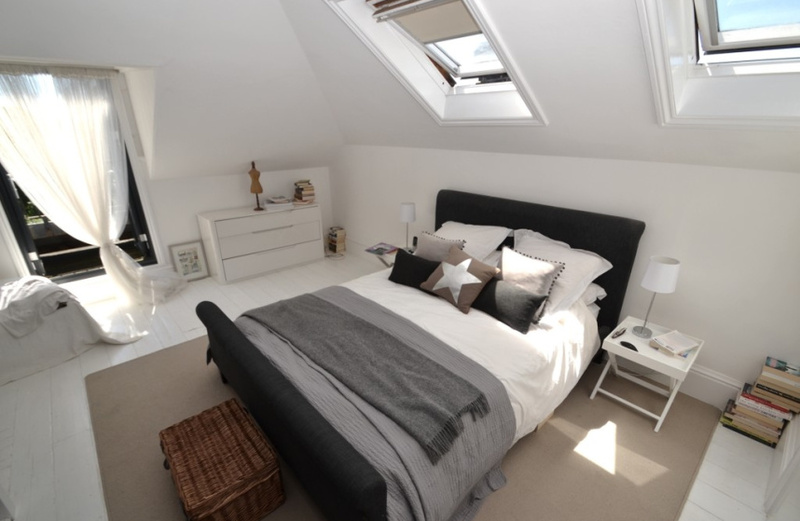 MASTER BEDROOM 29' x 17' 3" (8.84m x 5.26m) with 2 "Velux" double glazed skylights with window blinds. Radiator. Telephone points. Powder coated aluminium double glazed casement doors opening to small balcony with splendid views over the town. Built-in eaves storage cupboard. Track of 4 spotlights. Fitted Sliderobes with hanging rails and shelving. TV point. Additional walk-in shelved dressing area with rails and electric light. 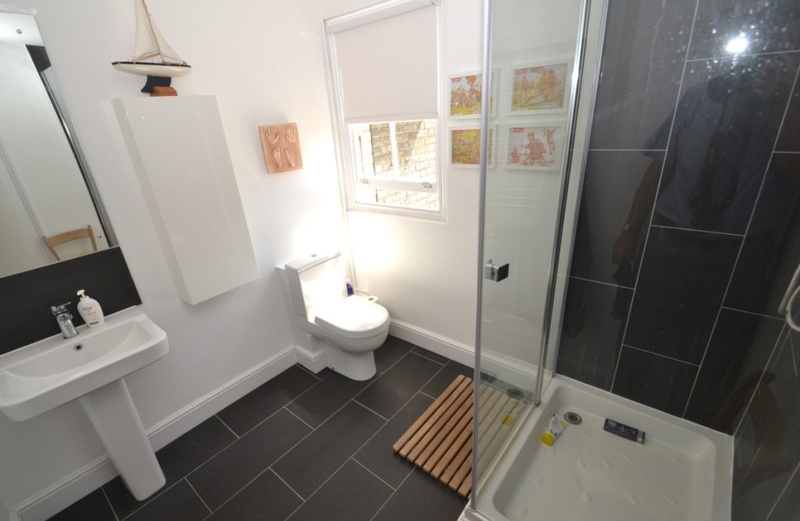 Spacious walk in shower with glazed screen and fully tiled walls and thermostatic fitted shower with rain forest head, wash basin (h & c mixer taps) with mirror over and free standing shelved unit under. Low level WC. Inset spotlights. Slate tiled floor. Extractor fan. Chromium heated towel radiator. 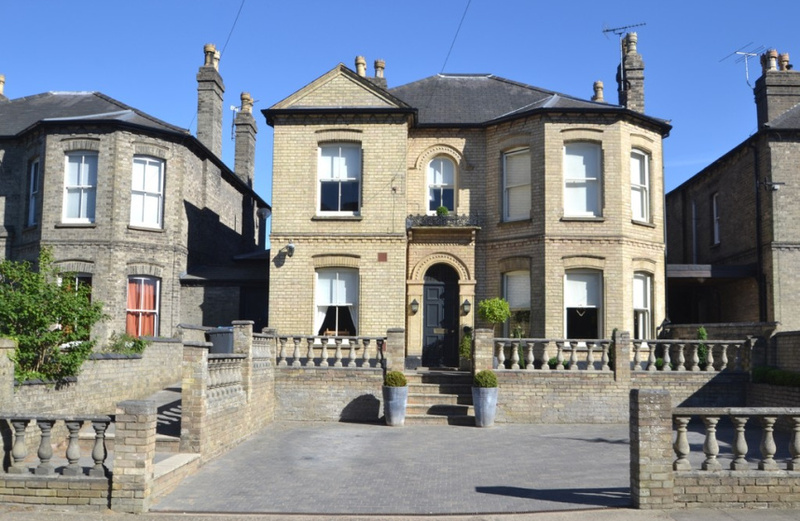 OUTSIDE The property is well recessed from the road by a good sized block paved front garden providing off road parking for 3 cars with ornamental brick and stone screen walls. A path leads to the side of the house with steps up to the front door. Twin courtesy lights. To the rear of the house is a very attractive part walled garden with attractive grey slate paved TERRACING with steps down to a lawn with matching paths and established shrub borders displaying a variety of ornamental flowering shrubs and trees. Access via a gate in one corner of the garden with a winding path leads to a Detached DOUBLE GARAGE 19'4" x 16'4" with electronic roller shutter door and rear personal door, approached off Vermont Crescent. The garage has electric light and power and is timber lined internally.